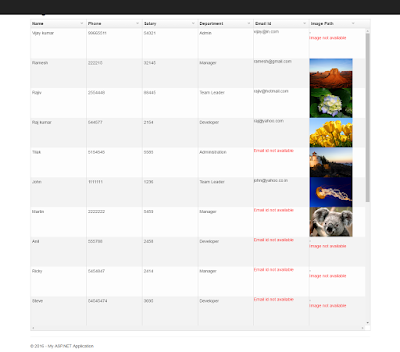 In this article I am going to explain how to display image in Angular UI-Grid in MVC application from database. In the previous article how to add auto increment serial number in RDLC report, howto change/alter the text using CSS and how to create sub report using rdlcreport. I want to show images from database in Angular UI-grid. We use the custom cell template to display the image. Add an empty controller to project. Create a Json action to get data from database. Now add view for Index action. Add the UI Grid script to page. Build the project and run the application.